In this post, we take a look at how powerful the features included in Spring MVC can be used to great effect in a web application. This is an in-depth look at the powerful features and internal workings of Spring Web MVC, which is a part of the Spring Framework. The source code for this article is available over on GitHub. Throughout this article, we’ll use the latest and greatest Spring Framework 5. We’re focusing here on the Spring’s classic web stack, which has been available from the very first versions of the framework and is still the primary way of building web applications with Spring. You can check out the current version of Spring Boot on Maven Central. To understand how Spring Web MVC works, you’ll implement a simple application with a login page. To show the login page, create a @Controller-annotated class InternalController with a GET mapping for the context root. To process a user login, create another method that handles POST requests with login data. It then redirects the user either to the success or failure page, depending on the result. These are joined for convenience so that the controller method can return them both at once. To render your HTML page, use Thymeleaf as a view template engine, which has solid, out-of-the-box integration with Spring. So, what does actually happen when you type http://localhost:8080/ in the browser, press Enter, and the request hits the web server? How do you get from this request to seeing a web form in the browser? Given the project is a simple Spring Boot application, you’ll be able to run it via the Spring5Application. Since Tomcat is a Servlet container, naturally every HTTP request sent to a Tomcat web server is processed by a Java servlet. So the Spring Web application entry point is, not surprisingly, a servlet. 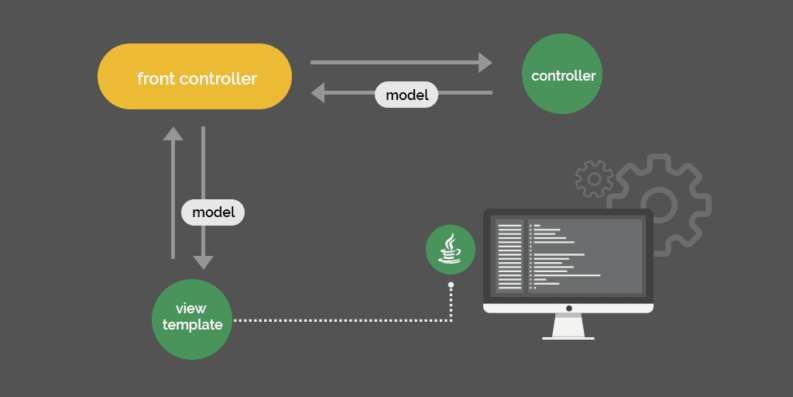 A servlet is, simply put, a core component of any Java web application; it’s low-level and does not impose too much in the way of specific programming patterns, such as MVC. An HTTP servlet can only receive an HTTP request, process it in some way, and send a response back. And, starting with the Servlet 3.0 API, you can now move beyond XML configuration and start leveraging Java configuration (with minor restrictions). generation of responses from DTOs, domain objects, etc. The Spring DispatcherServlet provides exactly that. It is the heart of the Spring Web MVC framework; this core component receives all requests to your application. First, let’s trace the processing of simple HTTP requests to a method in your controller layer and back to the browser/client. The DispatcherServlet has a long inheritance hierarchy; it’s worth understanding these individual aspects one by one, top-down. The request processing methods will interest us the most. Understanding the HTTP request, both locally during standard development, as well as remotely, is a critical part of understanding the MVC architecture. GenericServlet is a part of the Servlet specification not directly focused on HTTP. It defines the service()method that receives incoming requests and produces responses. This is the method that is eventually called on any request to the server, including a simple GET request. HttpServlet class is, as the name suggests, the HTTP-focused Servlet implementation, also defined by the specification. Next, HttpServletBean is the first Spring-aware class in the hierarchy. It injects the bean’s properties using the servlet init-param values received from the web.xml or from WebApplicationInitializer. In case of the requests to your application, the doGet(), doPost(), etc methods are called for those specific HTTP requests. FrameworkServlet integrates the Servlet functionality with a web application context, implementing the ApplicationContextAware interface. But it is also able to create a web application context on its own. As you already saw, the HttpServletBean superclass injects init-params as bean properties. So, if a context class name is provided in the contextClass init-param of the servlet, then an instance of this class will be created as an application context. Otherwise, a default XmlWebApplicationContext class will be used. As XML configuration is out of style nowadays, Spring Boot configures DispatcherServlet with AnnotationConfigWebApplicationContext by default. But you could change that easily. The same configuration may be done in a more modern Java-based way using the WebApplicationInitializer class. The HttpServlet.service() implementation, which routes requests by the type of HTTP verb, makes perfect sense in the context of low-level servlets. However, at the Spring MVC level of abstraction, method type is just one of the parameters that can be used to map the request to its handler. Then, the doService() method calls the doDispatch() method that is responsible for request dispatching. The main purpose of the dispatch() method is to find an appropriate handler for the request and feed it the request/response parameters. The handler is basically any kind of Object and is not limited to a specific interface. This also means that Spring needs to find an adapter for this handler that knows how to “talk” to the handler. To find the handler that matches the request, Spring goes through the registered implementations of the HandlerMapping interface. There are many different implementations that could suit your needs. Probably the most widely-used class for handler mapping is RequestMappingHandlerMapping, which maps a request to a @RequestMapping-annotated method of a @Controller class. This is exactly the mapping that connects the dispatcher with the hello() and login() methods of your controller. Note that your Spring-aware methods are annotated with @GetMapping and @PostMappingcorrespondingly. These annotations, in turn, are marked with the @RequestMapping meta-annotation. There are several provided types of handlers. Here’s how the SimpleControllerHandlerAdapter processes a Spring MVC controller instance (do not confuse it with a @Controller-annotated POJO). The second is SimpleServletHandlerAdapter, which adapts a regular Servlet as a request handler. In your case, a controller is a POJO with several @RequestMapping annotations, so any handler is basically a method of this class wrapped in a HandlerMethod instance. To adapt to this handler type, Spring uses the RequestMappingHandlerAdapter class. Note that the controller methods do not usually take HttpServletRequest and HttpServletResponsearguments, but instead receive and return many different types of data, such as domain objects, path parameters etc. Also, note that you are not required to return a ModelAndView instance from a controller method. You may return a view name, or a ResponseEntity or a POJO that will be converted to a JSON response etc. The RequestMappingHandlerAdapter makes sure the arguments of the method are resolved from the HttpServletRequest. Also, it creates the ModelAndView object from the method’s return value. The argumentResolvers object is a composite of different HandlerMethodArgumentResolver instances. There are over 30 different argument resolver implementations. They allow extracting of any kind of information from the request and providing it as method arguments. This includes URL path variables, request body parameters, request headers, cookies, session data etc. The returnValueHandlers object is a composite of HandlerMethodReturnValueHandler objects. There are also a lot of different value handlers that can process the result of your method to create ModelAndViewobject expected by the adapter. For instance, when you return a string from the hello() method, the ViewNameMethodReturnValueHandlerprocesses the value. But when you return a ready ModelAndView from the login() method, Spring uses the ModelAndViewMethodReturnValueHandler. By now, Spring has processed the HTTP request and received a ModelAndView object, so it has to render the HTML page that the user will see in the browser. It does that based on the model and the selected view encapsulated in the ModelAndView object. Also note that you could render a JSON object, or XML, or any other data format that can be transferred via HTTP protocol. We’ll touch more on that in the upcoming REST-focused section here. Let’s get back to the DispatcherServlet. The render() method first sets the response locale using the provided LocaleResolver instance. Let’s assume that your modern browser sets the Accept header correctly and that the AcceptHeaderLocaleResolver is used by default. During rendering, the ModelAndView object could already contain a reference to a selected view, or just a view name, or nothing at all if the controller was relying on a default view. This is a list of ViewResolver instances, including our ThymeleafViewResolver provided by the thymeleaf-spring5 integration library. This resolver knows where to search for the views, and provides the corresponding view instances. Beyond the typical MVC scenario, we can also use the framework to create REST web services. This is also possible thanks to the extensibility of Spring MVC. To marshall the internal DTOs to a REST representation, the framework makes use of the HttpMessageConverter infrastructure. For example, one of the implementations is MappingJackson2HttpMessageConverter, which is able to convert model objects to and from JSON using the Jackson library. In this article, you’ve gone through the processing of a request in the Spring MVC framework in detail. You’ve seen how different extensions of the framework work together to provide all the magic and spare you the necessity of handling the tough parts of the HTTP protocol. Published at DZone with permission of Eugen Paraschiv , DZone MVB. See the original article here.